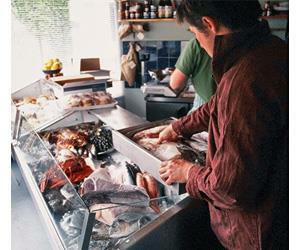 The Norfolk Fish Company, is an award winning fishmongers based in Holt, Norfolk. Established in 1997 by John and Fiona Griffin, the shops' reputation as a top quality fishmonger with the public, local restaurants and top chefs, has earned it the title of 'Fishmonger of the Year' twice. As well as supplying a wide range of fish, we also offer catering services for parties, weddings and functions, and in collaboration with local chefs ,we run workshops and demonstrations for cooks of all abilities. Sourcing top quality fish from as far a field as Scotland, as well as locally caught fish, The North Norfolk Fish Company, prides itself on the quality of its fish and service.